When he wailed "I want my MTV…" people responded with an overwhelming admiration and high esteem of wanting to witness Mark Knopfler live. Over the years, Knopfler has truly engaged his devoted league of followers with his guitar virtuoso and his string of smash hits. This year is no exception. As he dropped the announcement of his current tour, rock enthusiasts started flocking and grappling for tickets. 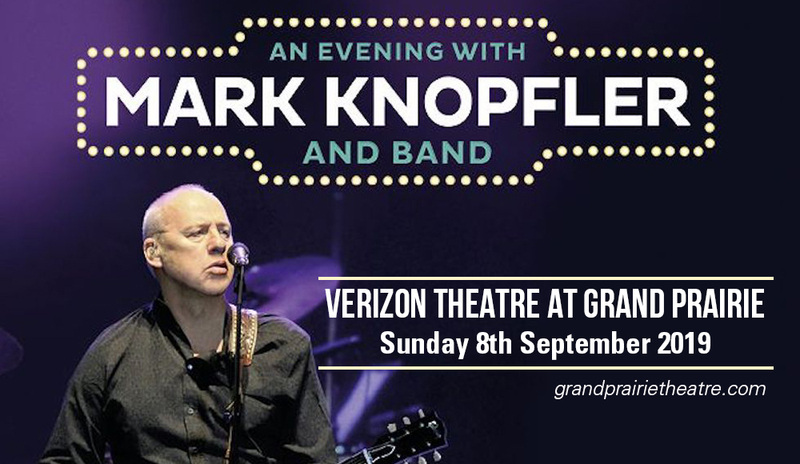 Part of his 28-date nationwide tour is Mark Knopfler's concert performance at the Verizon Theatre at Grand Prairie on Sunday 8th September 2019. Again, tickets are moving at a brisk pace so the best move is to start booking tickets as early as now! ‘Down The Road Wherever’ is Mark Knopfler's latest album is said to be his journey back to a wonderful and peculiarly detailed set of memories. His "…early days in Deptford with Dire Straits, a stray football fan lost in a strange town, the compulsion of a musician hitching home through the snow, and a man out of time in his local greasy spoon cafe…", are just some of the vividly picturesque scenes in his mind that were set to music. With his iconic stature, Mark Knopfler is not content with just writing, recording, releasing, and sitting waiting for royalties. He makes a sincere endeavor to take his songs on the road. "My songs are made to be performed live. I love the whole process of writing them alone and then recording them with the band, but ultimately the best part is playing them to an audience live. I enjoy the whole circus, travelling from town to town and interacting with this group of players is a total pleasure. I’m really looking forward to it." For this tour in particular, Knopfler has assembled and expanded into a 10-piece band composed of: keyboardist Guy Fletcher, guitarist Richard Bennett, pianist Jim Cox, whistle and flute player Mike McGoldrick, fiddle and cittern player John McCusker, bassist Glenn Worf, percussionist Danny Cummings, drummer Ian Thomas, saxophonist Graeme Blevins and trumpeter Tom Walsh. His trademark songs which include ‘Money For Nothing’, ‘Sultans Of Swing’, ‘Romeo & Juliet’ and ‘Walk Of Life’ are certified timeless classics. Marked as one of the greatest guitar players of all time, he is also a bonafide hitmaker has sold in excess of 120 million albums across his Dire Straits and solo career. No reason to miss this show. Go, get your tickets now!